Enjoy the Sights and Sounds of the River from this Private Retreat! 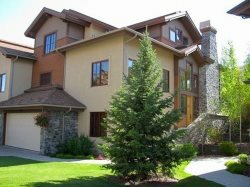 Located on 40 acres with 1/2 mile of Riverfront views and private River access, this stunning retreat is the perfect Sun Valley "get away" while downtown Ketchum or Hailey restaurants and shops only 13 minutes away. LIVING AREA: Warm and inviting with huge wood beams and wood floors, the Living Area is centered around a wood burning fireplace with plenty of seating for all. There is an adjacent alcove with with large flat screen TV and couch. GOURMET KITCHEN: Remodeled in May 2018, the kitchen features gorgeous quartz counters, double ovens, microwave, fireplace and counter seating for four. DINING AREA: Adjacent to the Kitchen, the Dining area seats 8. OUTDOOR LIVING: The wraparound deck that offers access to the patio with fire pit and a stone walk way that leads to a sandy beach by the river where there are chairs to sit and enjoy. Additionally, there is a screened porch off the dining area where you can relax and listen to the sounds of the river. This home also features a private hot tub and garden just off the kitchen.